Yesterday was a lot of fun. Realpage was very gracious to invite us to speak at their 2009 user conference, and we ended up having standing room only for our presentation. Very humbled for the excellent turnout and kudos to Kate Good and Lisa Trosien for recommending our session during their presentations. When thinking of what to speak about I somehow immediately thought of this concept my good friend Duncan Alney, with Firebelly Marketing, had been brainstorming about, The Corporate Mullet. It's a metaphor for your business and how wearing some business up front and a party in the back is a great way to build a brand and relationships offline and online. We focused on building the corporate mullet online specifically for the apartment industry, and used case studies from Urbane Apartments, J.C. Hart Company, and some non-apartment industry companies. Below is our slide show sharing some of our data. 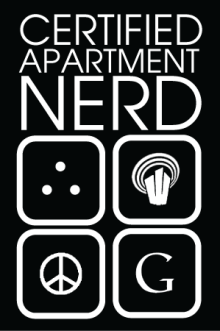 If you have any questions about our presentation please feel free to write a comment or email me directly at mark@theapartmentnerd.com. Thanks for stopping by and enjoy your day. View more presentations from themarketingnerd. man, wish i had thought of the mullet concept but i'm most excited that you shared success stories outside of our industry. there is so much to be learned from the companies you chose as well as many more in the hospitality and athletic club industries. lots of people are doing this right and they are not always in property management. thanks, Mark, for moving the online conversation forward. Mark, fantastic work. Social Media is taking the hard edge off of business and for that, we can all be grateful. Tracy, I feel I learn much more outside our industry in trying to create change. We'll keep trying to shake it up. Thanks for the support. Jeff, thanks for stopping by and helping spread our story. I really can't take credit for the metaphor. My man Duncan at Firebelly Marketing is the guy behind it. He's presenting the concept again next week in Philadelphia at their Social Media Club. What's interesting to us is that it's not just about social media, it's about building a brand online. Such a great concept - who doesn't love a Mullet? I really appreciate how social media personalizes brands / companies because you actually connect with the real people behind the corporation. Your examples are great, it is so important to look at all types of companies, not just property management. The old adage is still correct - people buy from people. That said we have to be careful to keep it authentic and not get too greedy! Aimee, thanks for stopping by and commenting. I love your comment about not being too greedy. From what I see, these tools are starting to be abused by marketing. It will be interesting to see if the masses will continue to utilize these tools as they are consumed by media trying to gain eyeballs to their brands. As we showed in our presentation, it's not necessarily about using the tools to communicate, but how they help build your brand presence in search as well. Thanks again, and enjoy your day! How Can You Help Turn Our Industry Upside Down?